Monthie Mechanical Inc is proud to serve the Wilmore community! About Wilmore, KY - Happy to be your hometown Heating & Air Conditioning Contractor! The city of Wilmore, located in Jessamine County, Kentucky, is situated in the central portion of the state near the big bend of the Kentucky River, approximately sixteen miles southwest of Lexington. Settled in 1779 by Revolutionary War soldiers and established in 1890, the development of the city of Wilmore was heavily influenced by Bishop Francis Asbury who founded the Bethel Academy in 1790. 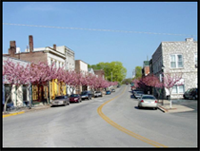 Today, Wilmore is home to a population of approximately 6,000 residents who appreciate the small town atmosphere of this warm, close-knit community, while enjoying the big city conveniences of the city of Lexington. Wilmore is a great city for history lovers who will enjoy the numerous historical sites of interest located in and around the city. The city’s historic downtown district, listed on the National Register of Historic Places, features a tour of the city’s historic sites including the Morrison-Kenyon Library built in 1927. Caboose Park features a vintage Norfolk Southern Railway caboose situated near the railroad crossing on East Main Street and houses historical artifacts unique to the city of Wilmore. Located just outside of the city is Highbridge Park, which features a circa 1877-railroad trestle that spans the Kentucky River and was once the highest railroad trestle in the world. Featured by the Smithsonian Institute, the trestle offers a magnificent view of the Kentucky River Gorge. The city of Wilmore hosts the Ichthus Music Festival; the nation’s oldest Christian music festival held each June that features over 100 bands and draws more than 25,000 people each year. Other events hosted by the city include the Festival of the Fourth, and the Wilmore Arts and Crafts Festival, held each year during the first weekend in October, that features handcrafted items made by local artists. Wilmore’s historic pride and community spirit, witnessed through the numerous historical sites and community events sponsored by the city, together with a pleasant, seasonal climate that brings long, hot summers and mild, cool winters, make it a great place to live, visit, and enjoy!